Google opened its Web application store for Chrome browser users on Tuesday, offering highly interactive, graphically rich applications from a variety of sources, including National Public Radio, Amazon.com, Electronic Arts and Sports Illustrated. Google also provided an update on its Chrome operating system, saying that the first netbooks running the OS will come in the first half of next year from Acer and Samsung. The announcements were made at a press conference in San Francisco at which CEO Eric Schmidt and Vice President of Product Management Sundar Pichai appeared. Schmidt called cloud computing a journey "we've been talking about for a long time" in reference to the Chrome browser, operating system and application store, which have all been built specifically for online use. 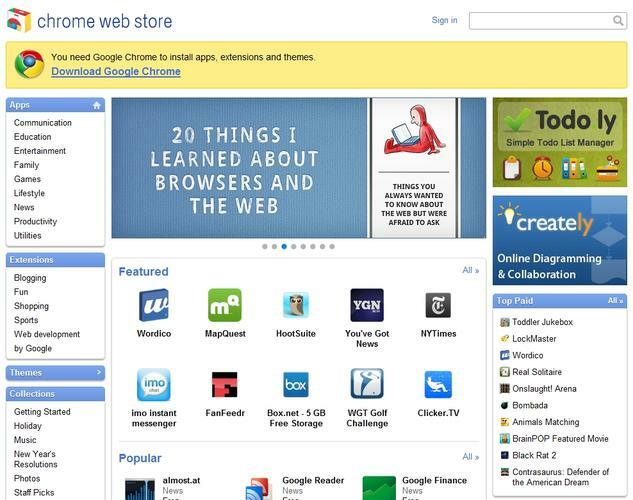 The Chrome Web store will open to users today. "We expect the number of available apps to grow very rapidly," Pichai said. Amazon officials demonstrated two applications. One lets users browse and search Amazon.com inventory, while the other is designed specifically for the Kindle device. Also demonstrated were a Pogo game from EA, and versions of The New York Times and NPR websites. The Chrome OS, which is still in development, has been designed for netbooks that are constantly connected to the Internet. To that end, all Chrome OS netbooks will ship with both Wi-Fi and 3G connectivity options. The 3G connectivity will be provided via a partnership with Verizon, which will offer various plans, including day passes and monthly subscriptions. Verizon will not require long-term contracts. Pichai also detailed a number of security features for Chrome OS that he said will make it "the most secure consumer OS that's ever been shipped." They include features like sandboxing, default encryption and verified booting. Officials from Citrix demonstrated a tool called Receiver that lets Chrome OS users access, via a browser, legacy enterprise applications including software from Microsoft and SAP. Google also announced a pilot program for Chrome OS netbooks. Initial participants include American Airlines, Kraft, Virgin America, Cardinal Health and the U.S. Department of Defense. These organizations will test Chrome OS netbooks for use by their employees. Google will also hold a similar pilot program for consumers interested in trying out prototype netbooks, which will feature a 12.1-inch display, full-size keyboard, oversized clickable touchpad and battery life of more than eight hours for active use and more than a week in standby mode.